Staystitching the top edges. 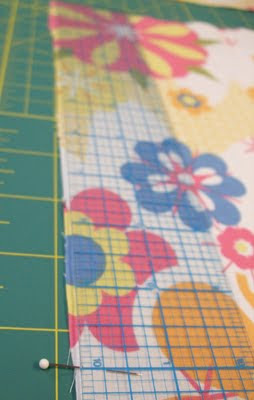 Staystitching helps edges from getting stretched out. The doohickey on the right is a seam guide. It has a magnet that sticks to the throat plate of my sewing machine. 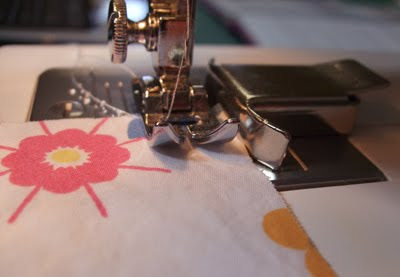 The seam guide helps keep seams consistent. I use it almost every time I sew a seam. Measuring along the back center seam for the zipper seam allowance. The zipper is 10 inches long. 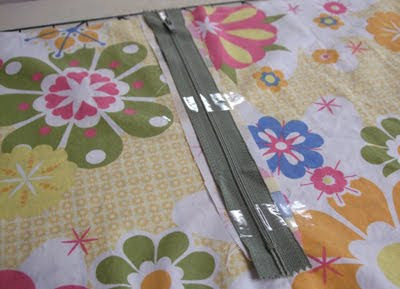 The directions called for fusing one-inch-wide strips of interfacing to the right side of each zipper seam allowance. I shuffled through my sewing-supplies stash and only came up with heavy-duty interfacing. This was a step I skipped for the muslin, but I guarantee it will not be omitted for the final skirt. Interfacing will provide the heavy zipper with stability and durability. The next step was staystitching three-quarters of an inch from the edge of the zipper seam allowance the length of the would-be zipper (in this case, 10 inches). The staystitching then pivots and runs off the edge. 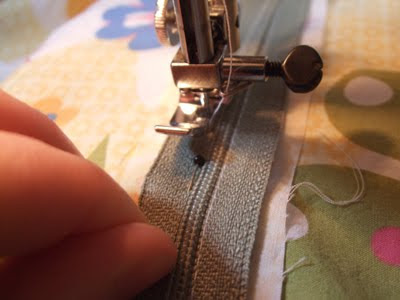 The seam below the zipper opening was sewn using a half-inch seam allowance. (BTW: The seam allowance for all seams in this skirt is 1/2 inch.) At this point I had the two back skirt pieces sewn wrong sides together from below the zipper opening. Clipped into the seam allowance. Diagonally clip into the seam allowances at the zipper base. Press the triangles formed at the zipper base to the wrong side under the seam allowance. I found these directions confusing. You’ll see as you read on that I did successfully install the zipper, but I think I pressed the triangles to the wrong place. 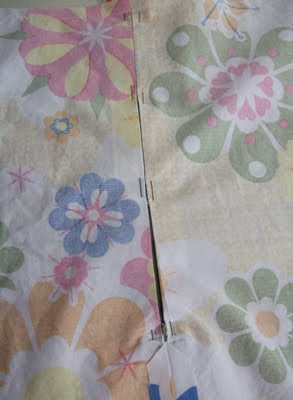 The triangles will be hidden under the zipper seam allowance, which will be on the outside of the garment. The pictures at CraftStylish are easier to understand than the directions. After the clipping, I pressed the bottom (non-zipper) seam to the INSIDE of the skirt, and I pressed the zipper seam allowance to the OUTSIDE of the skirt along the staystitching. Very clever! 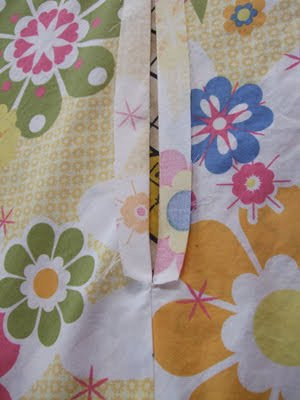 The zipper seam allowance is pressed to the outside of the skirt. The bottom angled corners should probably be sharper — something to remember for the final garment. The next step is basting the zipper to the zipper seam allowance. Now I’m always looking for tools that will make my sewing more even and professional looking, and one of my favorite tricks is to use Scotch tape for basting. It’s not a complete substitute for pins, but it’s really useful. 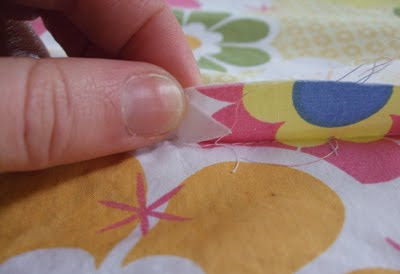 You can peel it away when you’re done, and tape is a lot safer and easier to handle than sharp pins, and, unlike pins, you can sew over it. See the shiny tape on the zipper seam allowance? This is where I should have put the tape! Are you more clever than I? Did you realize that when I put tape on the zipper seam allowance, and then put the zipper on top of the allowance AND SEW IT DOWN that the tape would be trapped, and I would be unable to peel it away? Pretty smooth, eh? So the picture above shows the side on which I should have stuck the tape. I still could have worked the the seam to be nice and even from this side, and after the zipper was stitched on, I could have peeled the tape off. Instead, the zipper is a wee bit jammy. Oh well. Test garment, people. This is just a test. 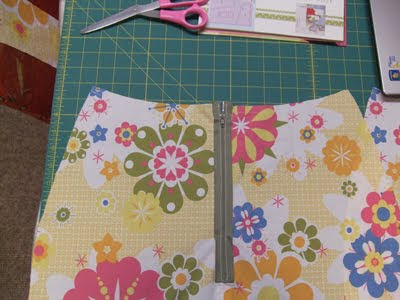 The zipper is taped to the zipper seam allowance on the right side of the skirt. I’m a little out of order with the pictures, but I figured showing back-to-back what I did wrong and what I should have done was most logical. Maybe it’s a smidge paranoid to both tape the seam and then tape the zipper to the seam (and I also pinned the zipper to the seam allowance, too), but if these tricks keep stuff from sliding around, I’d rather use them than rip out wonky stitches. THINK before you pin. Notice how I have to push the pin out by the sharp end under the presser foot. It was poor planning. I should have visualized how I was going to run the skirt through the sewing machine and pinned accordingly. After I taped the zipper and seam allowance into oblivion, I finally stitched the zipper to the skirt. The directions called for stitching as close to the zipper teeth as possible. The directions didn’t say anything about the zipper being open for sewing, so I left the zipper closed. This was (sort of) a mistake. It’s been a while since I put in a zipper, and I forgot that there are some tricks about when to have the thing pulled up versus down. The first side I sewed around the outside the zipper without much incident (some slightly goofy stitches), but coming up the other side was a pain. It involved planting the needle, lifting the foot, wiggling the zipper under the foot so it lands behind the foot, and dropping the foot and continuing. Stitching so close to the zipper teeth might inherently be a pain, but I’m going to do some research and see if I can figure out a smoother way to stitch. The next step is to trim the excess seam allowance (the part that sticks out past the zipper tape). 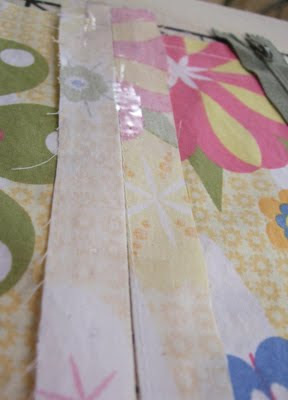 After than, the directions call for stitching the outer edge of the zipper tape. I am skipping the last step because I plan to remove the zipper after I’m finished with the muslin, and more stitches = more stitches to rip. I’ve gone far enough with the zipper to get a proper fit with the skirt. Next up: sewing the side seams and making the waistband. Again, if you have tips, questions, or comments, please drop me a line!